Between an average-priced USB that could last maybe up to two years and a high-priced USB that could last for up to 5 years, what would you choose? After being recently introduced to the market, the SLC NAND-equipped Zalman USB 3.0 flash drive seems to have a little bit of both worlds – priced fair and durable – but can it really deliver? Korean company, Zalman, has decided to expand its product line and enter the SSD market with the Zalman USB 3.0 stick. While Zalman is mostly known for its notebook coolers and cases, the company is no stranger to flash memory as many of their products have flash memory chips. With this new product, what they say about great things come in small packages is proven true. Zalman USB 3.0 is a true memory storage powerhouse as it incorporates SLC (Single Level Cell) NAND flash memory, an element that is more commonly found in more expensive SSDs. SLC-based chips are faster and more durable compared to MLC-based chips. What does this mean for your USB? It means longer lasting functionality, one thing that many USB sticks today lack. And because Zalman uses USB 3.0 technology, the flash drive is notably faster and more efficient in both reading and writing operations. The drive can transfer at a speed of up to 155 megabytes of data per second for reading and up to 135 megabytes per second for writing. The Zalman USB 3.0 flash memory stick is the very definition of storage performance and durability. Not to mention that it also looks sleek and sophisticated in black, with a protective cap and measuring 78x17x8.6 millimeters. Designed to improve efficiency and performance, Zalman USB 3.0 flash memory stick can handle all your storage needs. 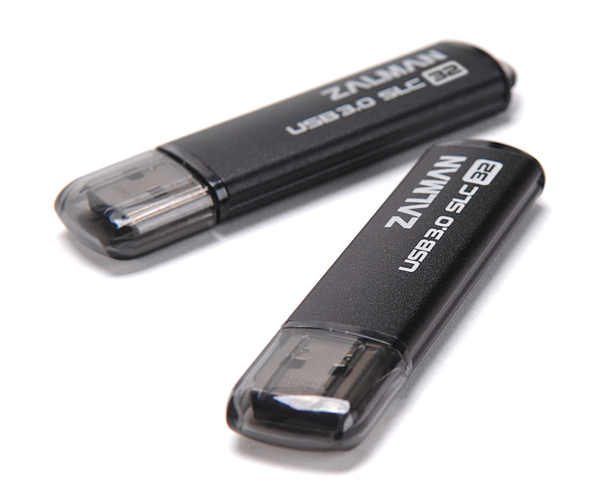 Zalman USB 3.0 flash drive is significantly more expensive than MLC-based flash memory chips. But come to think of it, MLC-based memory chips are significantly slower and less durable. The flash drive’s availability is yet to be announced but as for pricing, it is said to be valued at $69 for the 16GB and $113 for the 32GB. This entry was posted in Articles, SuperSpeed USB 3.0, USB 3.0, USB 3.0 Chipsets, USB 3.0 Flash Drives and tagged SLC Nand, USB 3.0 Flash Drive, USB 3.0 technology, Zalman USB 3.0 Flash Drive, Zalman USB 3.0 flash memory stick, Zalman USB 3.0 stick. Bookmark the permalink.